You should have already reviewed Section 3.2, Planning Your Basic GroupWise System and filled out the worksheet. The following sections step you through the GroupWise Installation program, Installation Advisor and, Setup Advisor. 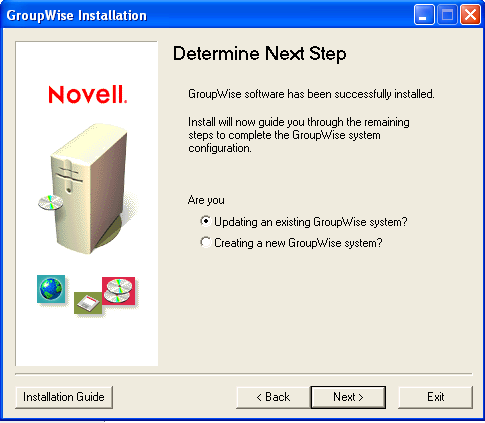 The Installation Advisor installs the GroupWise software. It then launches the Setup Advisor to create your domain and post office, set up the GroupWise agents, and set up the GroupWise Windows client (if desired) on your local machine. IMPORTANT:If you plan to install GroupWise in a clustered server environment, see the GroupWise 7 Interoperability Guide before starting to set up your GroupWise system. At a Windows machine that meets the administrator machine requirements listed in Section 2.1, GroupWise Administration Requirements, log in as an Admin equivalent to the eDirectory tree in which you are installing GroupWise. 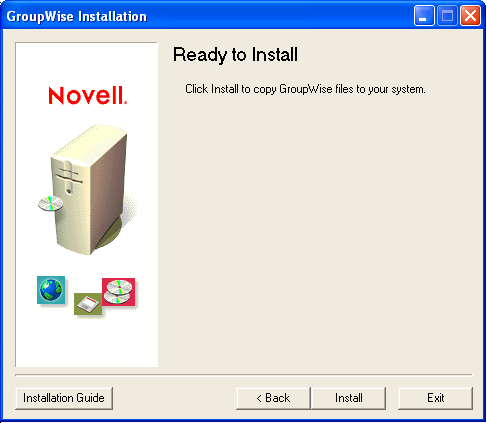 Insert the GroupWise 7 Administrator for NetWare/Windows CD into the CD drive to start the GroupWise Installation program. If the Installation program does not start automatically, run setup.exe from the root of the CD. Click Create or Update a GroupWise System, then click Yes to accept the license agreement and display the Welcome to GroupWise Install page. Click Next until you reach the Administration Options page. Make sure that Create a New System or Update an Existing System is selected, then click Next. 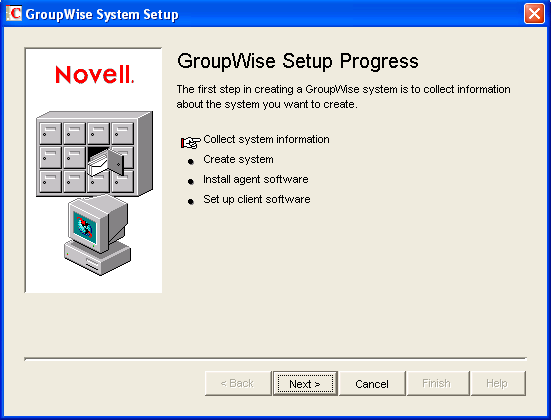 Continue with Installing the GroupWise Software. Follow the prompts to provide the following information from your Basic GroupWise System Worksheet. When you have provided this information, the Installation Advisor is ready to install the GroupWise administrative software. 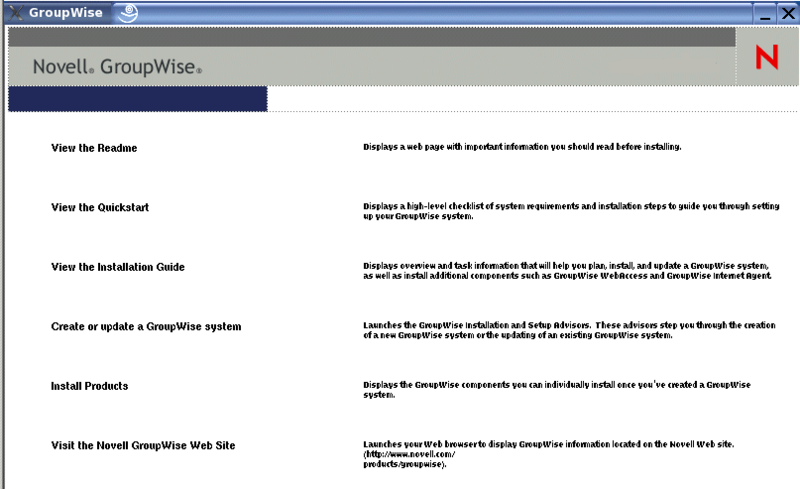 The Installation Advisor installs GroupWise software to the ConsoleOne location and software distribution directory. Follow the prompts until you reach the Determine Next Step page. Select Creating a New GroupWise System, then click Next to display the Run ConsoleOne page. Continue with Providing System Information. The Installation Advisor launches ConsoleOne with the GroupWise Setup Advisor active. On the Run ConsoleOne page, click Run to start ConsoleOne and the GroupWise Setup Advisor. The Setup Advisor provides an overview of the information it needs to collect in order to create your basic GroupWise system. Follow the prompts to provide the GroupWise system and domain information from your Basic GroupWise System Worksheet. Follow the prompts to provide the GroupWise post office information from your Basic GroupWise System Worksheet. Follow the prompts to provide information about how to link the domain and the post office from your Basic GroupWise System Worksheet. When you have provided the system, domain, post office, and link information for your GroupWise system, you are ready to create users. However, adding users at this point is optional. After the Setup Advisor has finished, you can add users to the post office at any time by using ConsoleOne. Add any users that you listed on your Basic GroupWise System Worksheet, then click Next. The Setup Advisor summarizes your overall progress. Click Next to display a summary of the system, domain, post office, and link information you entered. Continue with the Creating Your Basic GroupWise System. After you have verified that the information you entered is correct, you are ready for the Setup Advisor to create your GroupWise system. The Setup Advisor creates the GroupWise system using the information you provided. 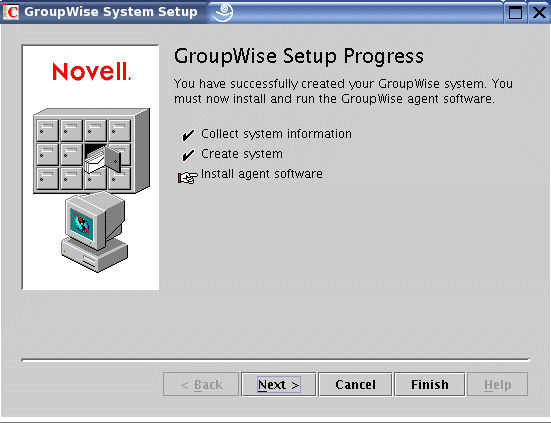 When your system has been created, click Next to display the GroupWise Setup Progress: Install Agent Software page. 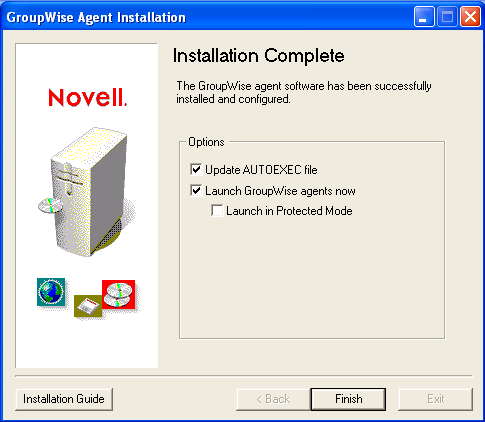 Continue with Installing and Starting the GroupWise Agents. At this point, the Setup Advisor has created GroupWise objects in eDirectory and directory structures on servers for your GroupWise system. You now need to install and start the MTA and POA on your NetWare or Windows server. On the GroupWise Setup Progress page, click Next to have the Setup Advisor launch the Agent Installation program and display the Select Platform page. 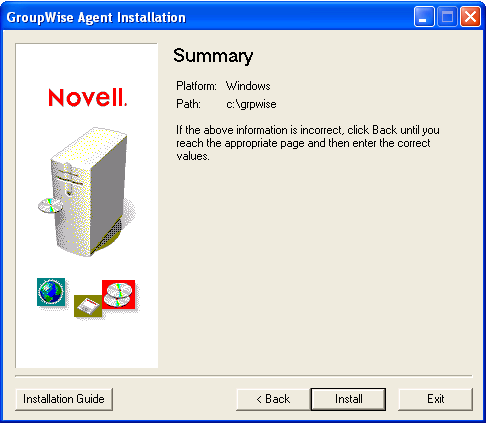 If you are installing the NetWare agents (worksheet item 21), continue with NetWare: Installing and Starting the GroupWise Agents. If you are installing the Windows agents (worksheet item 21), skip to Windows: Installing and Starting the GroupWise Agents. Follow the prompts to provide NetWare Agent information from your Basic GroupWise System Worksheet. Review the information displayed on the Summary page, then click Install to install the NetWare agents. The Installation Complete page appears when the software has been installed. Update AUTOEXEC File: Select this option to reference the grpwise.ncf file from the server’s autoexec.ncf file so that the GroupWise agents are automatically loaded whenever the server is started. 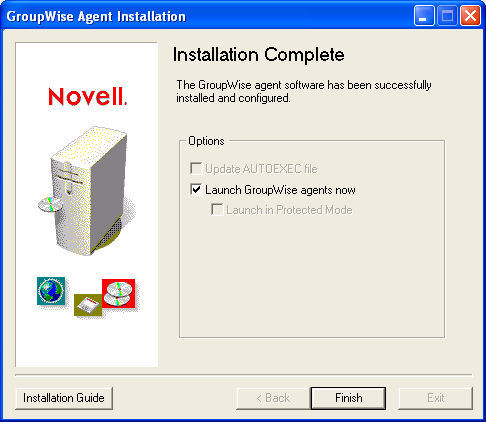 Launch GroupWise Agents Now: Select this option to have the Installation program start the GroupWise agents for you immediately. You should only do this if the MTA and POA are on the same server as the domain and post office directories. If you want the agents to run in protected mode, select Launch in Protected Mode. Click Finish to return to the Setup Advisor. The GroupWise Setup Progress page is again displayed. If you selected Launch GroupWise Agents Now, skip to Step 8. To configure the agents to access the remote server where their domain and post office directories have been created, continue with Step 6. Use a text editor to modify the agents’ startup files. 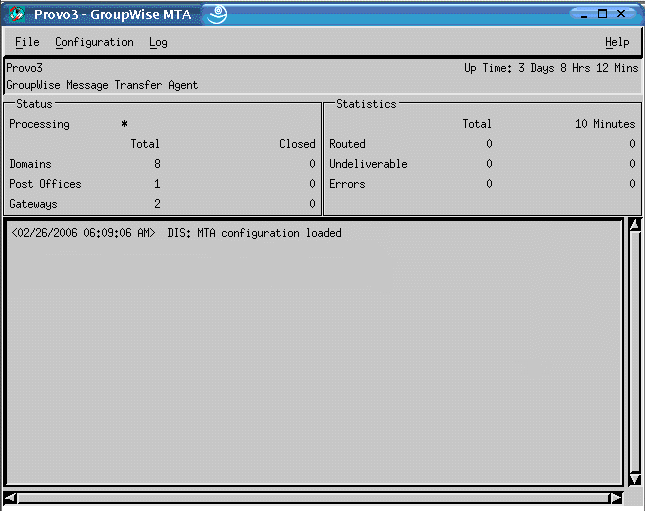 The load command in the grpwise.ncf file includes a startup switch that points the agents to their startup files. The startup files include configuration information the agents need to function properly. When the MTA is not on the same server as the domain directory, you need to edit the MTA startup file to include the MTA’s eDirectory distinguished name. When the POA is not on the same server as the post office directory, you need to edit the POA startup file to include the POA’s eDirectory distinguished name. The startup files are located in the agent installation directory you specified in Step 1. The MTA startup file is named domain.mta, where domain is the first 8 letters of the domain name (for example, provo.mta). The POA startup file is named post_office.poa, where post_office is the first 8 letters of the post office name (for example, research.poa). At the NetWare server console, enter grpwise.ncf to start the agents. If the agents do not start successfully, see Starting the NetWare GroupWise Agents. Now that you have the NetWare agents installed and running, skip to Setting Up and Running the GroupWise Windows Client on Your Local Machine. To install the Windows agents, you must run the Agent Installation program at the Windows server where you are installing the agents. If you are already running the Agent Installation program at the Windows server where you are installing the agents, skip to Step 6. Click Exit to close the Agent Installation program that was launched automatically by the Setup Advisor, go to the Windows server where you want to install the agents, then continue with Step 2 below. Make sure you are logged in as an Admin equivalent and have network access to the software distribution directory (or the GroupWise 7 Administrator for NetWare/Windows CD), domain directory, and post office directory. Start the Agent Installation program (install.exe in the agents subdirectory), then click Yes to accept the license agreement and display the Overview page. Select Install, then click Next to display the Select Platform page. Select Windows, then click Next. Follow the prompts to provide Windows Agent information from your Basic GroupWise System Worksheet in the order listed. 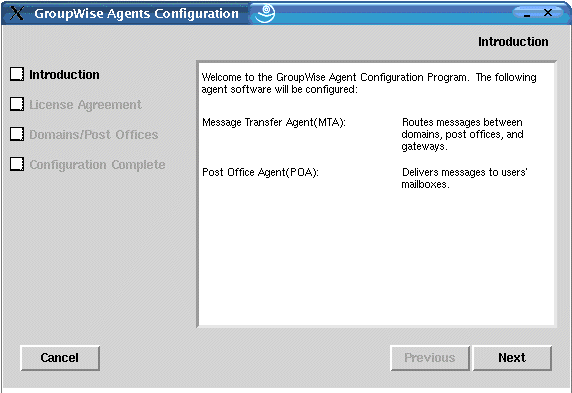 If you are not running the Agent Installation program on the same server as the GroupWise Setup Advisor, the Domains/Post Offices page is displayed. The MTA and POA must know the location of the domain and post office directories. Continue with Step 9. 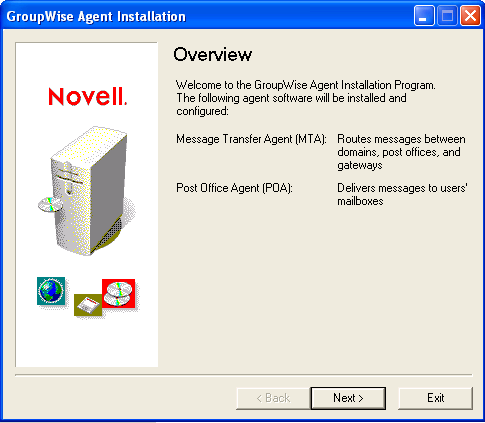 If you are running the Agent Installation program on the same server as the GroupWise Setup Advisor, the Setup Advisor passes the domain and post office information to the Agent Installation program so you are not prompted for it again. Skip to Step 13. To specify the location of your domain, click Add, select Domain, specify the domain name, provide the path to the domain directory, then click OK. The location you specify for the domain directory is stored in the MTA startup file. When you start the MTA, it reads the startup file to find the location of the domain directory. The MTA then reads the domain database (wpdomain.db) in the domain directory for all configuration information it needs to run. The MTA startup file is located in the agent installation directory you specified in Step 7. The startup file is named domain.mta, where domain is the first 8 letters of the domain name (for example, provo.mta). To specify the location of your post office, click Add, select Post Office, specify the post office name, provide the path to the post office directory, then click OK. The location you specify for the post office directory is stored in the POA startup file. When you start the POA, it reads the startup file to find the location of the post office directory. The POA then reads the post office database (wphost.db) in the post office directory for all configuration information it needs to run. The POA startup file is located in the agent installation directory you specified in Step 7. The startup file is named post_office.poa, where post_office is the first 8 letters of the post office name (for example, research.poa). If you are installing the agents as Window services, the Windows Service Information page is displayed. Fill in the service information (worksheet item 25), then click Next to display the Summary page. If you are not installing the agents as services, the Summary page is displayed. Click Install to install the agents. The Installation Complete page appears when the files have been installed. Update the AUTOEXEC File: This option does not apply to the Windows agents, so it is dimmed. Launch GroupWise Agents Now: This option applies only if you installed the agents as Windows applications, rather than services. Select this option to start the GroupWise agents as applications. If the agents do not start successfully as applications, or if you need to start them as services, see Starting the Windows GroupWise Agents. Click Finish, then if necessary, return to the workstation where the Setup Advisor is running. The Set Up Client Software page is displayed. Now that you have the Windows agents installed and running, continue with Setting Up and Running the GroupWise Windows Client on Your Local Machine. In the Setup Advisor, click Next to launch the GroupWise Windows client Setup program, then follow the prompts. When setup is finished, double-click the GroupWise shortcut on your desktop to start the GroupWise Windows client. 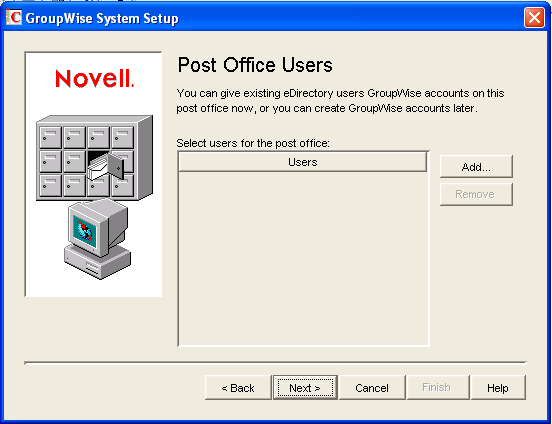 Because the GroupWise client can get the location of your post office from eDirectory, and because you do not yet have a password on your mailbox, the GroupWise client starts without prompting you for post office and password information. 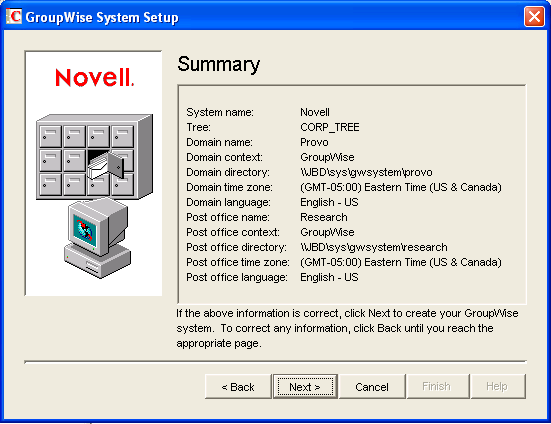 If the GroupWise client cannot get the location of your post office from eDirectory or cannot access the post office, the GroupWise Startup page appears. You should make sure that you are logged in through your own eDirectory user account and not through an Admin account, and that your current eDirectory tree is the tree in which the post office is located. 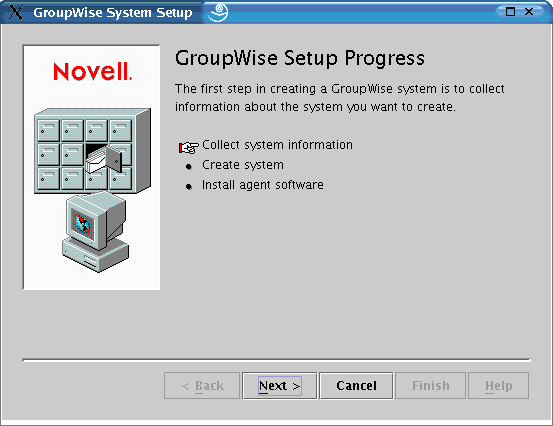 By default, the GroupWise client logs in to GroupWise as the user who is logged in at the workstation. If you are not logged in as yourself, you might receive a “user not found” error; specify your GroupWise user ID in the User ID field, then click OK to log in. Setting A Mailbox Password: After you are logged in and using GroupWise, one of the first things you should do is set a password on your mailbox so that other users cannot access it. For information about setting a password, see Help in the GroupWise client. Sending Messages and Scheduling Appointments: You can send messages to or schedule appointments with any users you have added to the post office. To test your system, you might want to send a message to yourself. As soon as users set up the GroupWise clients on their workstations, as described in Section 8.4.1, Setting Up the GroupWise Windows Client, they will also be able to send messages and schedule appointments. Using Document Management Services (Optional): GroupWise Document Management Services (DMS) lets you store documents in GroupWise libraries. Library documents can be shared with other users, versioned, and searched for within the library. The Setup Advisor created a library under the post office directory. For information about using Document Management Services, see Help in the GroupWise client. 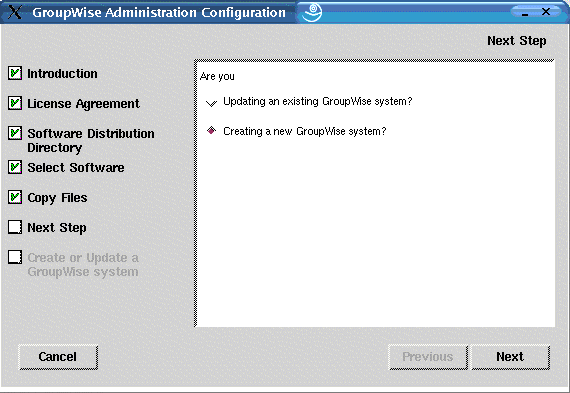 Continue with Installing the GroupWise Administrator Snap-Ins to Additional Windows Machines. If you have installed all the administrative software you need, skip to Section 3.4, What’s Next. As part of creating your basic GroupWise system, the GroupWise Administrator snap-ins to ConsoleOne were installed in one location (worksheet item 2). If ConsoleOne is installed in multiple locations and if you want to be able to administer GroupWise from those locations, you need to install the GroupWise snap-ins to each ConsoleOne installation. Go to the Windows machine where you want to install the GroupWise snap-ins to ConsoleOne. Make sure you are logged in as an Admin equivalent and have network access to a software distribution directory (or GroupWise 7 Administrator for NetWare/Windows CD) and the domain directory. Accept the License Agreement, then follow the prompts to provide the necessary information. In the Administration Options dialog box, deselect Create a New System or Update an Existing System. Also deselect Copy Files to a Software Distribution Directory. Then continue to install just the GroupWise Administrator snap-ins to ConsoleOne. Repeat Step 1 through Step 5 for each location where you want to install the GroupWise snap-ins. Skip to Section 3.4, What’s Next. The following sections step you through the GroupWise Installation program, Installation Advisor, and Setup Advisor on Linux. 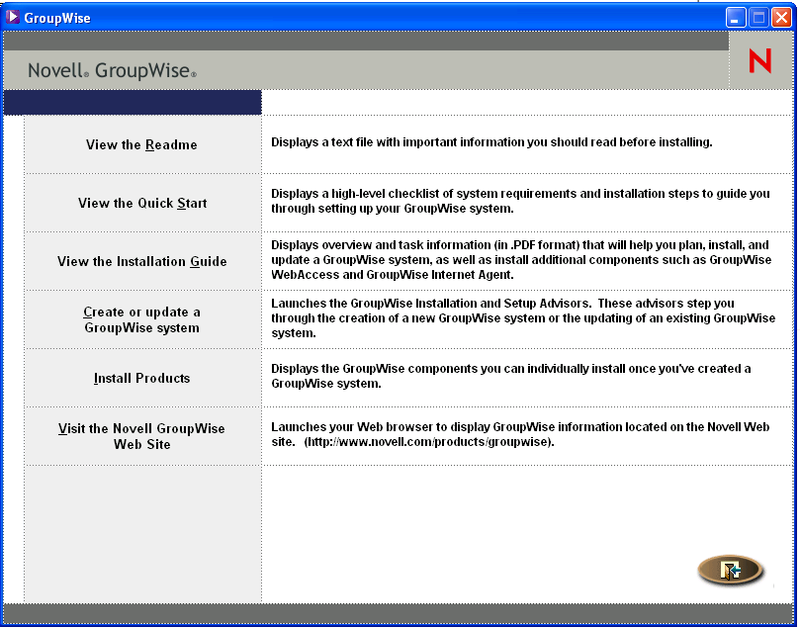 The Installation Advisor installs the GroupWise software on your Linux server. 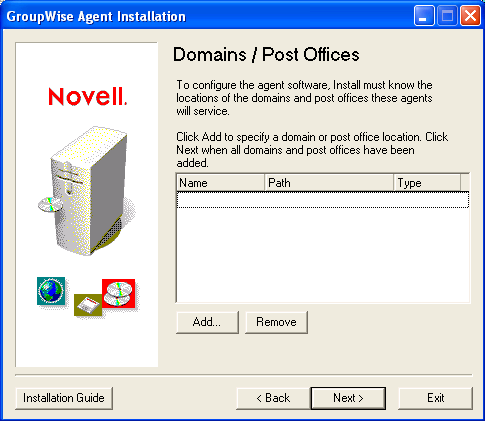 It then launches the Setup Advisor in ConsoleOne to create your domain and post office and set up the GroupWise agents. If you are new to Linux, you might want to review Useful Linux Commands for Administering a GroupWise System in GroupWise 7 Troubleshooting 2: Solutions to Common Problems before beginning to set up your GroupWise system on Linux. Make sure that ConsoleOne is installed on your Linux server. ConsoleOne is installed in /usr/ConsoleOne/bin. If ConsoleOne and eDirectory have not yet been installed on your system, see Novell eDirectory. In a terminal window, become root by entering sux and the root password. The sux command enables the X Window System, which is required for running the GUI GroupWise Installation program, Installation Advisor, and the Setup Advisor. 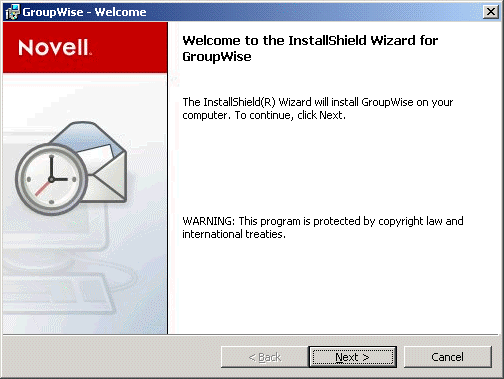 If you are not using the X Window System, you can install GroupWise components individually, as described in Installing the GroupWise Agents Using the Text-Based Installation Program. Change to the root of the GroupWise 7 Administrator for Linux CD. Select the language in which you want to run the GroupWise Installation program, then click OK. NOTE:On Linux, all available languages are included in the same RPM, so all languages are always installed. 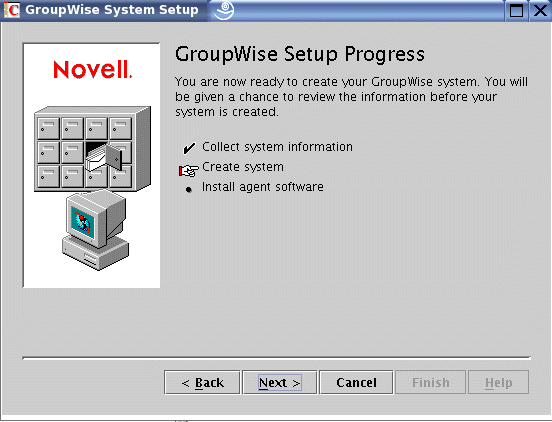 Click Create or Update a GroupWise System to start the Installation Advisor. The list on the left details the steps the Installation Advisor performs for you. 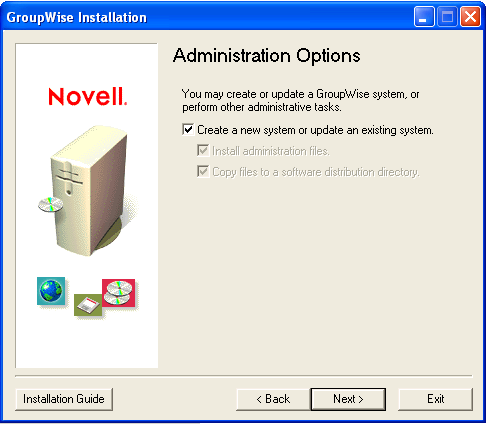 The Installation Advisor automatically installs the GroupWise Administrator snap-ins to ConsoleOne under /usr/ConsoleOne. Then, the Installation Advisor copies the selected software components into your software distribution directory. When the copying is complete, click Next. Select Creating a New GroupWise System, then click Next. You use the New System utility in ConsoleOne to create your basic GroupWise system. Click Run to start ConsoleOne. The first time you start ConsoleOne with the GroupWise Administrator snap-ins installed, you are prompted to specify a Linux mount directory under which you create mount points. Typically, Linux servers and workstations use /mnt for this purpose. In the future as your system grows, this information helps ConsoleOne resolve the UNC paths of GroupWise database locations into Linux paths. Although the mount directory information is not used when you are creating your basic GroupWise system, it is gathered at this time for later reference. IMPORTANT:Although NetWare and Windows are not case-sensitive operating systems, the case of characters in pathnames becomes significant when the directory structure is mounted to a Linux machine. In the Linux Mount Directory dialog box, browse to and select the Linux mount directory, then click OK. The typical Linux mount directory is /mnt. In the future, you and other GroupWise administrators might have different mount points depending on the workstation or server where ConsoleOne runs. To change the mount directory later in ConsoleOne, click Tools > GroupWise System Operations > System Preferences > Linux Settings. 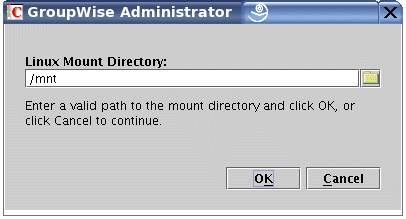 The mount directory information is stored in a user-specific preferences file (.consoleone/SnapinPrefs.ser in each GroupWise administrator’s home directory). Continue with Using ConsoleOne to Create Your Basic GroupWise System. ConsoleOne automatically attempts to authenticate to an eDirectory tree when it starts. If the Login dialog box does not appear automatically, select the NDS® object, then click File > Authenticate. 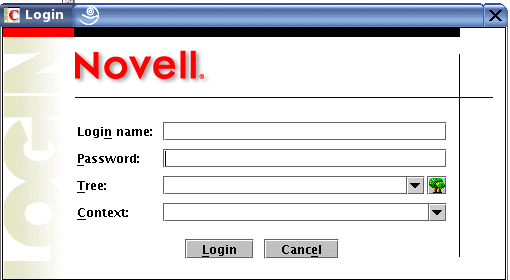 Login Name: Provide a Novell eDirectory username that has rights to create eDirectory objects. Password: Provide the password for the username. Tree: Type or select the eDirectory tree where you want to create GroupWise objects. If the eDirectory tree is located on a Windows server, you might need to specify the IP address of the server instead of the tree name. Context: Provide the full context of the User object associated with the username you provided. Under the NDS object, select the tree where you want to create the GroupWise system, then click Tools > GroupWise Utilities > New System. Click Next to create your GroupWise system. Click Next to install the MTA and POA software. Continue with Installing and Starting the Linux GroupWise Agents. At this point, the Setup Advisor has created eDirectory objects and network server directories associated with your GroupWise system. You now need to install and start the MTA and POA on your Linux server. The Setup Advisor starts the Agent Configuration program for you. Review the Introduction, then click Next. On the Configuration Complete page, Launch GroupWise Agents on System Startup is selected by default. IMPORTANT:If you want to configure the agents for high availability, as described in Enabling the High Availability Service for the Linux GroupWise Agents, they must be configured to start automatically on system startup. If you do not want the agents to start automatically when the server restarts, deselect Launch GroupWise Agents on System Startup. Click Exit to complete the configuration. Continue with Starting the Linux Agents with a User Interface. The sux command enables the X Window System, which is required for running GUI GroupWise agent server consoles. Change to the GroupWise agent bin directory. The --show startup switch starts the MTA with a server console interface similar to that provided for the NetWare and Windows MTAs. This user interface requires that the X Window System and Open Motif be running on the Linux server. The --home startup switch specifies the domain directory and is required to start the MTA. The @domain.mta startup switch specifies the MTA startup files, which contains the --home startup switch. The ampersand (&) causes the MTA to run in the background, so that the terminal window you started it in is again available for use. The status messages displayed on the MTA server console are also written to the MTA log file (mmddmta.nnn) in the /var/log/novell/groupwise/domain.mta directory. The log file name includes the month and day when it was created, along with an incrementing extension to accommodate multiple log files on the same day. In ConsoleOne, you can see that the domain database has been updated by the MTA because the Version field on the Identification page of the Domain object shows 7 when the database update is complete. Wait until the domain has been updated before you start the POA. 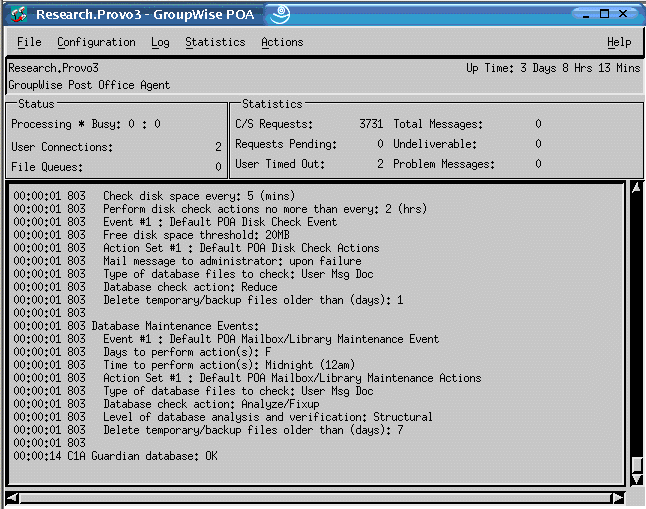 The status messages displayed on the POA server console are also written to the POA log file (mmddpoa.nnn) in the /var/log/novell/groupwise/post_office.poa directory. The log file name includes the month and day when it was created, along with an incrementing extension to accommodate multiple log files on the same day. In ConsoleOne, you can see that the post office database has been updated by the POA because the Version field on the Identification page of the Post Office object shows 7 when the database update is complete. 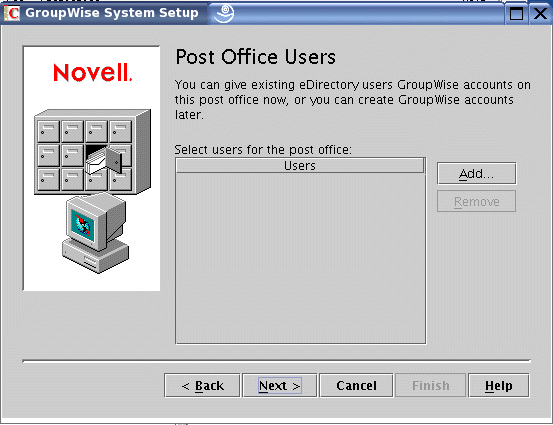 After the post office database has been updated, you can install the GroupWise Cross-Platform client and connect to the post office. If you want to finish setting up your basic GroupWise system, continue with Setting Up and Running the GroupWise Cross-Platform Client on Your Local Machine. The Create or Update a GroupWise System option in the GroupWise Installation program does not include installation of the GroupWise Cross-Platform client. Therefore, you have to install it separately. 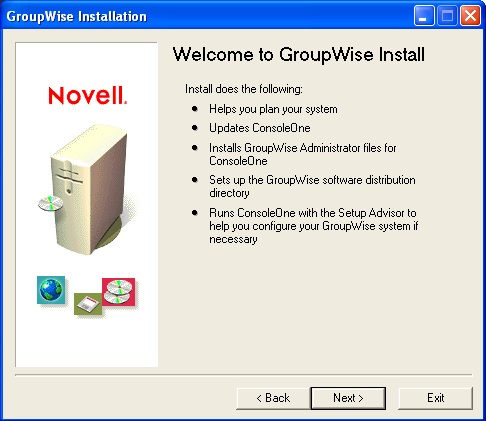 On the GroupWise Installation program main page, click Install Products > Install GroupWise Client. When the Cross-Platform client files have been copied, click OK.
To start the Cross-Platform client, click its icon on your desktop. Specify your GroupWise user ID, password, and the required information about the server where the POA is running (worksheet item 18), then click OK.
Sending Messages and Scheduling Appointments: You can send messages to or schedule appointments with any users that you have added to the post office. To test your system, you might want to send a message to yourself. 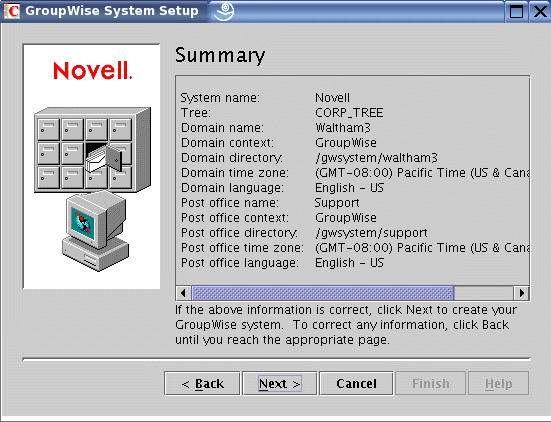 As soon as users set up the GroupWise clients on their workstations, as described in Section 8.4, Setting Up the GroupWise Client, they will also be able to send messages and schedule appointments. Continue with Installing the GroupWise Administrator Snap-Ins to Additional Linux Machines. As part of creating your basic GroupWise system, the GroupWise Administrator snap-ins to ConsoleOne were installed under /usr/ConsoleOne of the server where you ran the GroupWise Installation program. If ConsoleOne is installed in multiple locations and if you want to be able to administer GroupWise from those locations, you need to install the GroupWise snap-ins to each ConsoleOne installation. Go to the Linux machine where you want to install the GroupWise snap-ins to ConsoleOne. Make sure you are logged in as root and have network access to the software distribution directory (or GroupWise 7 Administrator for Linux CD) and the domain directory. 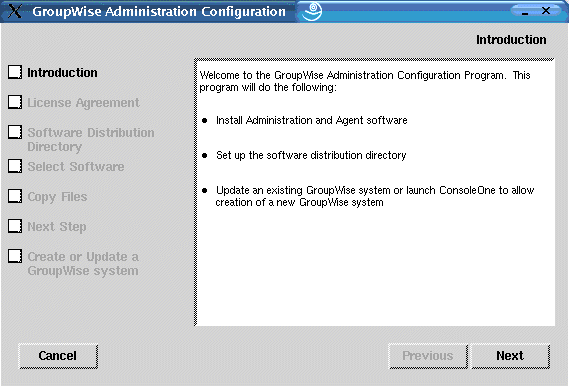 Start the GroupWise Installation program (install at the root of the software distribution directory or the CD), then click Install Products > GroupWise Administration > Install Administration. When the installation is complete, click OK, then click Configure GroupWise Administration.